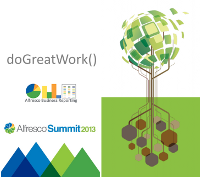 Alfresco Business Reporting uses an ’embedded’ version of Pentaho Reporting. That’s why you can develop your reports in the Pentaho Report Designer, and Alfresco can execute those and store the results back in its repository. In the previous release of Pentaho Reporting there was a nasty bug in the PDF’s generated, if you happened to use Adobe as a PDF viewer. Some fields or labels were just not displayed (although showing fine in other viewers). Pentaho recently released a new community version of the Report Designer (5.1) that actually fixes this bug. So, I implemented this into the Alfresco Business Reporting module, for download as of ‘now’. And you get some minor bug fixes for free too. 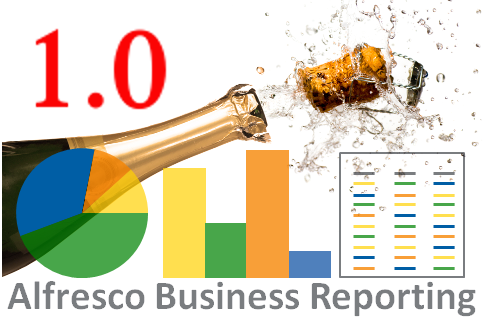 Alfresco Business Reporting 1.0 released! This year I was a speaker at the Afresco Summit in Barcelona. It was quite an experience, and sharpened my skills. Also led to good discussions, great new contacts, nice chats and something nice with wine.